I have received the following missive on the subject of the very first performance at the Inky Fingers Mini Festival. It sounds entertaining, and I for one will be heading along to find out more. On Monday the 8th of August at half past of the twelve, in the downstairs boudoir of The Forest Cafe, in Edinburgh, comma, myself and Mr James Anderson (Apprentice Tailor) shall be performing unto you a historical presentation regarding – I just saw a chicken, go me – a historical presentation regarding an unexplored nugget in the Edinburghian Fish’n’Chip Emporium that is Time. ‘The Life and Times of an Edinburgh Monster’ is a title that, in hindsight, gives away quite a lot. Via the medium of lying, Mr James Anderson will contact the spirit world and appear unto you as various characters from history – also two live men – and I will interview him regarding what he has seen, re. The Monster of the title. Largely I get no response, or escorted from the garden centre, but occasionally I find grains of truth, hidden from sight. And I plough these grains like a bad metaphor. What happens when you plough grains? That’s right: Fact. So, Monday’s half our slide-show and interview extravaganza will essentially be my sewing my grains of fact amongst the ignorant. What can you expect from this? Well, you will doubtless learn a few bits and pieces about the history of Edinburgh, the greatest city of all time in the Lothian area. You will learn about its peoples and places, and snobbery and violence, and trade and commerce, and its surrounding hillsides. For example. 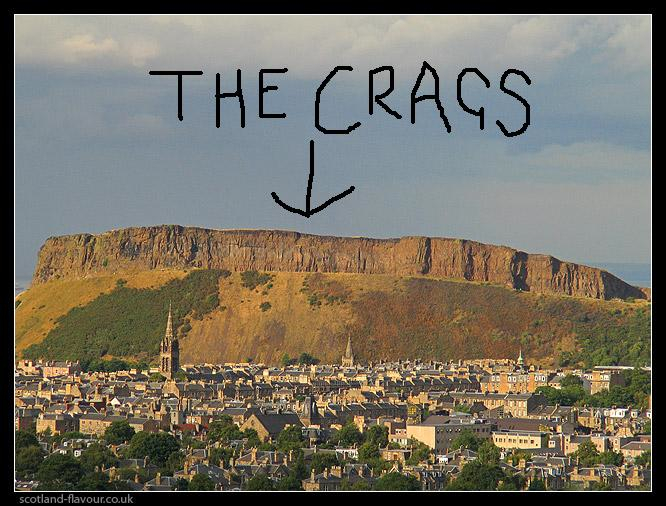 This is The Crags. So know you now. If you wish to learn anything then you too should head on down to witness the first event in the Inky Fingers Summer Minifest, which has other things on that are less good but probably still worth watching.